"In addition to its speed, it was the reliability of the Newscycle solution - as well as the top tier outlets the company services - that made us choose NewsEdge to provide the up-to-the-minute market news the Vox Markets community counts on." Vox Markets, the trusted online platform for the investment community, announced today that it has selected the NewsEdge Protocol Suite from NEWSCYCLE Solutions to power its real-time financial news and information service. Vox Markets gives investors the easiest way to track news and updates about the stock market companies they follow. 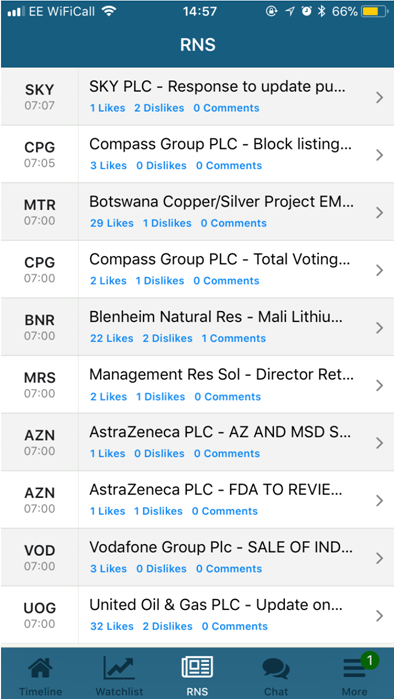 As well as offering live RNS alerts and push notifications, Vox Markets aggregates detailed information on UK listed companies including essential pricing data, detailed charts, broker notes and press mentions onto one community platform. Vox Markets chose the NewsEdge Protocol Suite because of the speed and reliability it provides. The point-to-point connection delivers content with near real-time latency into the Vox Markets platform with guaranteed delivery so that no financial news updates are missed. NewsEdge is on the US Simultaneous Disclosure Network – and runs the system for two of the five main US disclosure wires – which means that Vox is guaranteed to receive disclosures at the earliest possible time. NewsEdge provides a guaranteed transmission of XML news over a secure internet connection that Vox Markets will host in its data center. With the NewsEdge solution, the Vox Markets team will be able to distribute to users the news and updates they've chosen to receive, and segment this content by company, industry, named source providers, subject, geography or any other combination. NewsEdge, a division of NEWSCYCLE Solutions, is an advanced technology company devoted to delivering breaking news and multimedia in formats that make the content usable and searchable for business professionals in need of reliable information. NewsEdge has clients in the digital publishing and financial services communities who depend on speedy delivery, cutting-edge technology, reliable 24x7 support, and an ability to handle multiple formats. A variety of delivery options are available for content from thousands of news sources. More than half-a-million news articles daily are aggregated and optimized in near-real time to provide valuable insights and intelligence to business leaders throughout the world. Newscycle is the leading provider of software and services powering the global media industry. Our content management, advertising management, subscription management and mobile solutions help companies drive profitability and accelerate digital business models. With headquarters in Bloomington, MN and regional offices throughout the world, NEWSCYCLE Solutions a trusted partner serving over 10,000 news media, broadcast, magazine, financial services and corporate clients. Please visit http://newscycle.com for more information or write to us at info@newscycle.com. Vox Markets is an online platform that allows investors to easily track the companies they follow in the stock market. The mobile and desktop platform offers live RNS alerts and push notifications, detailed company charts, pricing data, broker notes, analyst research and much more. Described by The Times as “A Facebook / LinkedIn / Twitter for traders, brokers, market makers, equity salesmen and other associated market professionals,” it also lets companies directly engage with their shareholders by sharing news and updates on the platform.